A boxer from Huntsville, Texas, he holds the title of ABO International Light Heavyweight Champion and is preparing for his shot for the world title in Galveston. Alfonso came to see us for weakness and pain in his left shoulder early last year. His left hook was his best punch but he wasn’t able to throw it due to the pain he was experiencing from years overuse and trauma from taking hits as a boxer. As a result, Alfonso had been fighting with only one arm. His treatment plan included a series of ultrasound guided biologic stem cell injections that allowed us to target the exact source of pain into his left scapula and rotator cuff and blast those areas with growth factors to regenerate the damaged cells and promote natural healing. Before his first round of stem cell treatment, his punching power was at 50%. We all know that is - no bueno - for a boxer. Stay tuned for an update and please feel free to show his some love and wish him luck as he earns his shot at the world title. My amazing patient, Tim, has been in a lot of pain for a long time. Tim came to see us earlier this year for help with elbow pain and knee pain. His elbow pain was a result of typical wear and tear from building homes and performing ranch work over the past 10+ years. Swinging a hammer became increasingly unbearable for him. His primary care physician began cortisone steroids injections to help relieve the pain. They helped at first, but the pain kept coming back, worse than before and the cortisone shots became less and less effective. Recently, Tim developed pain behind the knee from this same work. On a typical day of several trips up and down the ladder, he twerked his knee and has been in pain ever since. Tim really wants to stay active and he usually starts every day with a 3-mile walk – unless pain flares kick in. On those days, he is not able to enjoy his walks and not able to work. Before he was referred to me, Tim had seen other physicians that told him he needed surgery. A surgeon explained that Tim’s only solution for his elbow was to have surgery, which involved grinding down the elbow to reattach the ligaments, sowing them to the bone, and leaving him in a sling for 8 weeks. Luckily, Tim was referred to me by a colleague, Dr. Jeffrey Pruski for stem cell treatment. We began with a series of ultrasound-guided injections that allowed me to target the exact source of his pain and blast it with growth factors to regenerate the damaged cells. CJ retired from the NFL in March 2018 at the young age of 26. He was the No. 65 overall pick in the 2014 NFL Draft, and unfortunately, had to hang up his spikes due to numerous impairing injuries. After years of playing professional football, his body has taken, and given, plenty of beatings. CJ came to me with deep pain in both shoulders and knees. CJ received injections of biologic stem cells into both shoulders and both knees to reduce pain sensations and promote healing in these areas. Check back for an update on CJ's progress. Thank you, CJ, for trusting me with your recovery journey. Dr. Nash (left) with David Duke (right) just before his procedure. 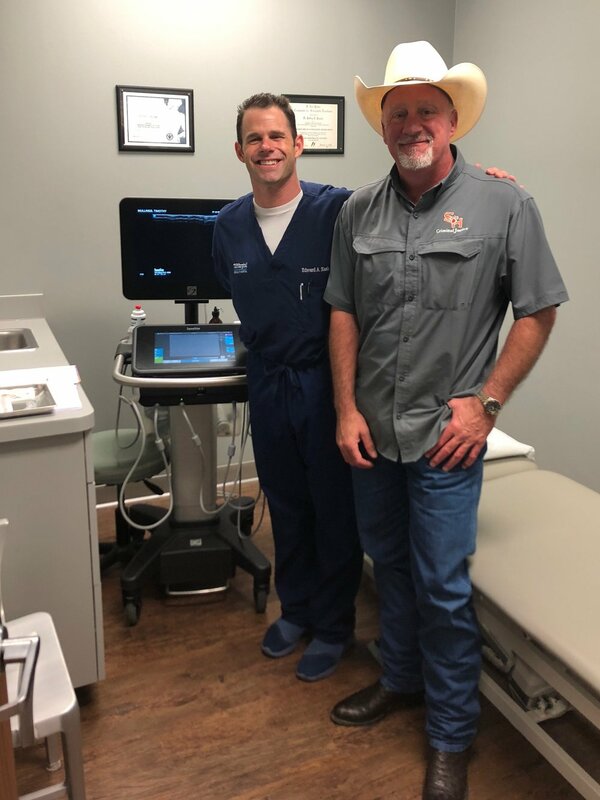 “I was referred to Dr. Nash after surgery to remove a pilonidal cyst – which is a sac filled with debris and hair that occurs in the area at the top of the crease of the buttocks overlying the tailbone. This cyst and overlying skin in the area became infected, forming a painful abscess. I describe it as the mother of all ingrown hairs on your tailbone that is horribly infected and spreads out like an octopus, eating the bone and nerve tissues. These cysts are notoriously painful and difficult to get rid of. It made sitting incredibility painful and difficult. After surgery to remove it, healing was difficult. The pain was getting worse instead of better – it was not pain from the actual surgery, but nerve pain. The cyst had damaged my spinal cord. I went to several physicians over the past few years, but none of them knew how to treat this or even where to refer me. I was finally referred to Dr. Nash by a neurologist that knows his experience and success with regenerative medicine, helping patients in pain, suffering from difficult conditions. After meeting him and a thorough evaluation, I felt very comfortable with the treatment plan he developed for me. Three rounds of ultrasound guided injections of amniotic fluid. After the first round, I seemed noticeably better, which gave me hope. After the second round, I felt confident that we were making significant improvements and wanted to wean myself off the nerve pain medications that had given me horrible side effects. This was a huge accomplishment for me. My pain level went from consistently being around a 7-9, down to a 2-3. I’m not seeing much of a difference after this last round, but am still hopeful - this may not cure my condition 100%but it has significantly improved it. “Stemming from an injury at 12 years old, I developed arthritis, had four bulging discs and sciatica. I couldn’t even sleep because the pain was so bad. I had been to several other doctors, but they just wanted to mask my symptoms. Dr. Nash has been one of the most supportive doctors I have ever had. He’s the only one that said, “Let’s fix it!”...and he did! Two weeks after my first visit with him, my pain was gone. My quality of life has resumed! 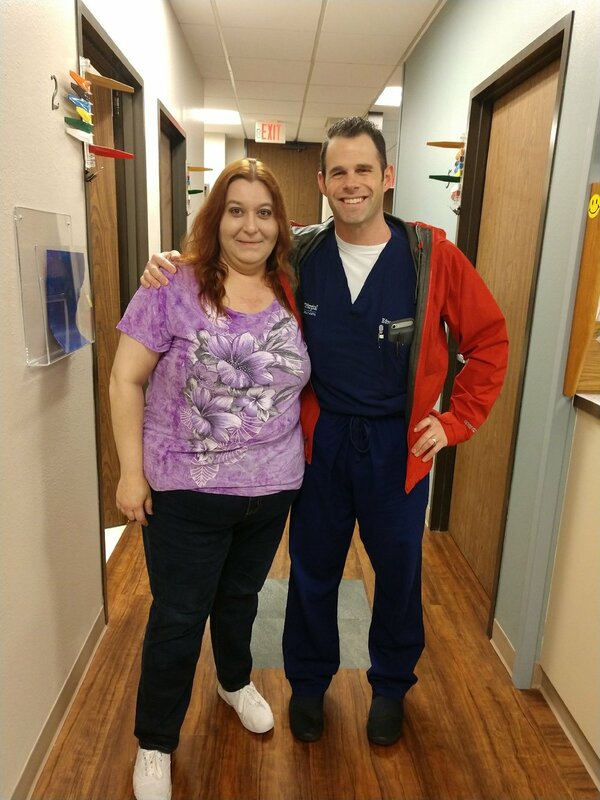 Dr. Nash is world class – always greets me with a smile and a hug. He personally gave me his cell phone and email. He truly wants to help and improve his patients’ lives.